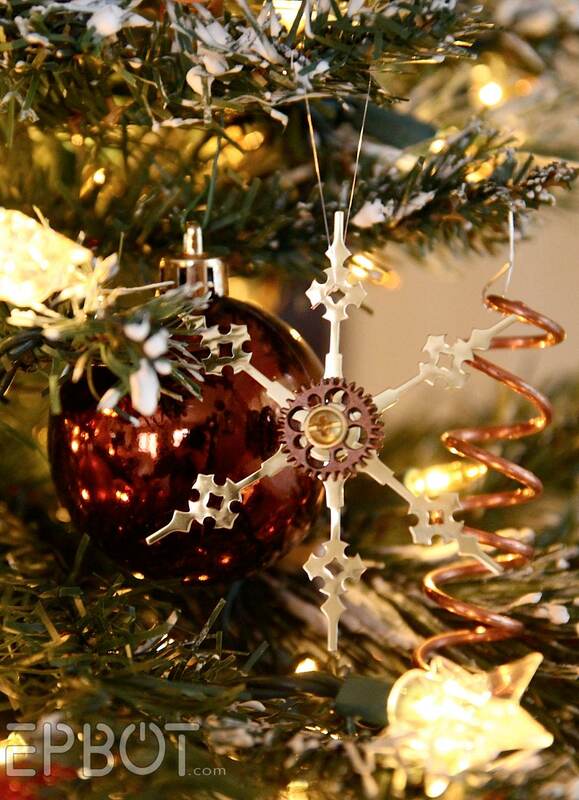 EPBOT: My New & Improved Steampunk Tree! 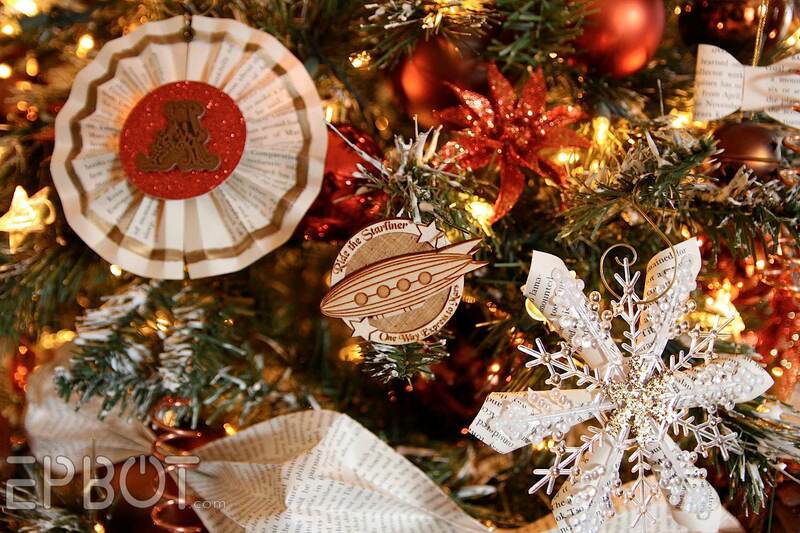 I've been spending all my time crafting the Harry Potter tree this month, but in order to make room for it I had to combine last year's two trees into one - so I thought you'd like to see! The steampunk elements are smaller (I plan to add larger gear ornaments & goggled top hats, but sweet StayPuft, where is the time going?!) but once you get closer you can see all the copper wire spirals, clock-hand snowflakes, hot air balloons, etc. John and I don't have sentimental ornaments from our childhoods or early years together, so it's fun building up a cache with memories attached. Whether it's a gift or something we made ourselves, I like that now more and more of our trees actually means something. 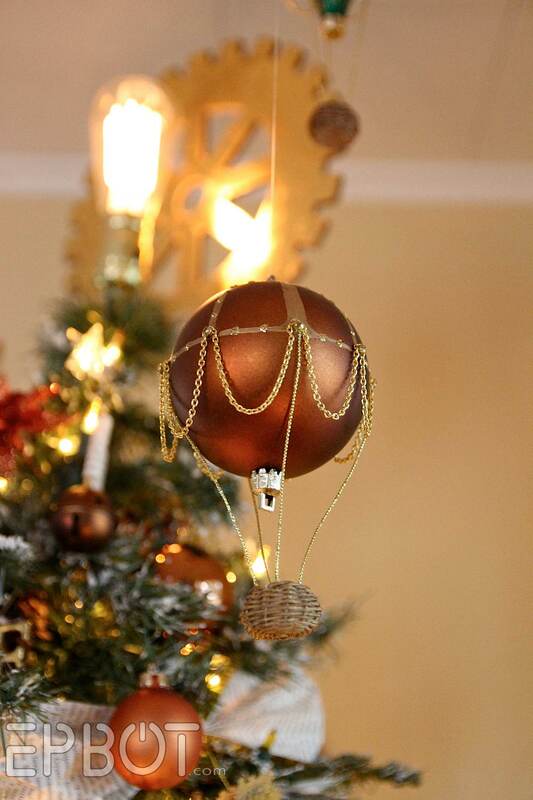 Happy to say that after three years our balloons are still holding up great, as is my homemade tree flocking! It was hard leaving all the shiny fuchsia and teal ornaments packed away this year, but worth it, I think, to make room for Potter. It looks awesome! 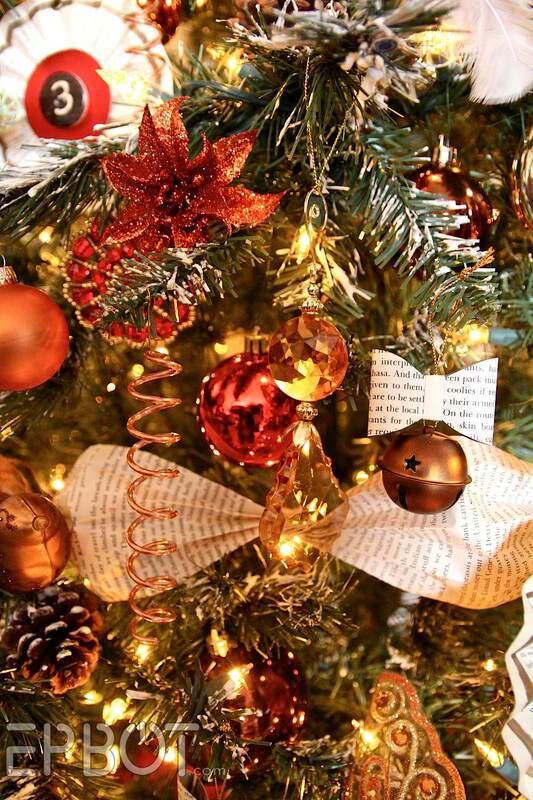 Does your cat mess with your tree? We can't figure out how to stop ours from climbing it. Jen this is all amazing, but one quick question? How many days/month does it take to put all this stuff away?? Forever and more I expect. Putting it all away is MUCH faster than putting it all up, so pack-up only takes about a day, with John helping. It helps that we have a place for everything, and other than the trees, it all goes into large stackable bins. Shuttlecraft to Enterprise! Shuttlecraft to Enterprise. Spock here. Happy holidays. Live long. And prosper. Yep! 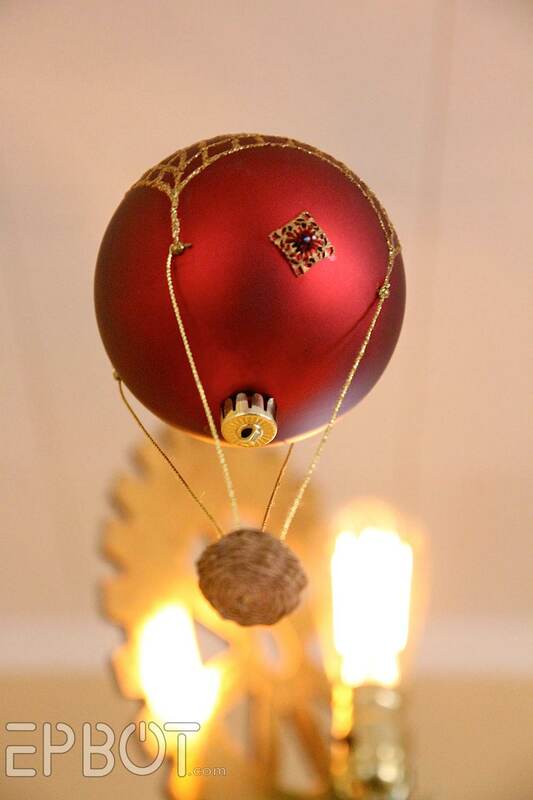 We have that ornament too!! 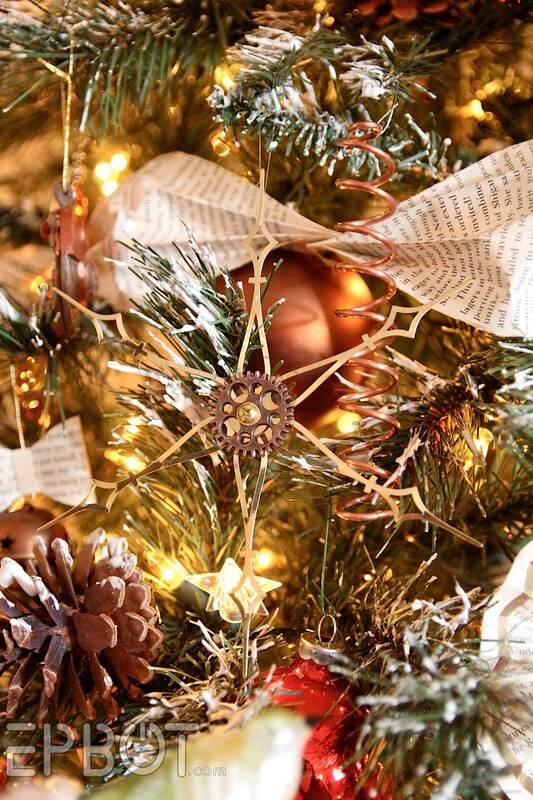 i LOVE the paper and acrylic (I'm assuming) snowflake in image 3283!!!!! did you make those too? I did, yes, and I keep planning to make more! There's another close-up here, but it's essentially rolled paper cones glued to a dollar store plastic snowflake. 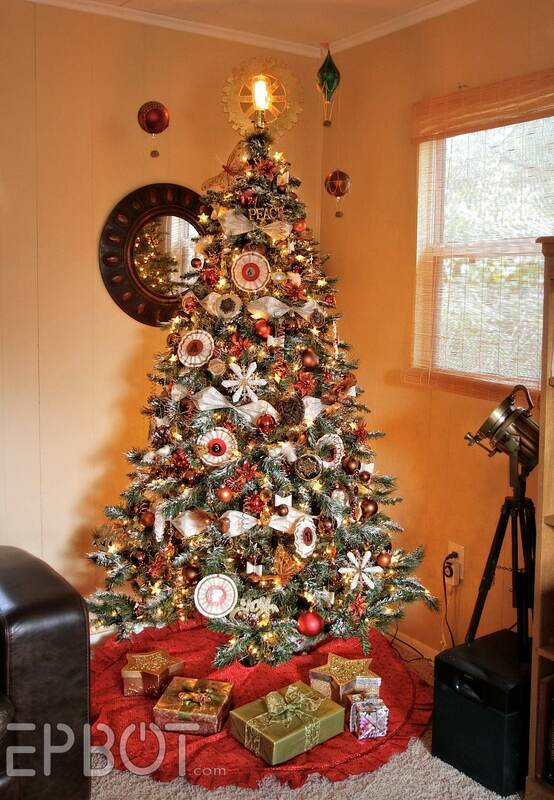 The tree looks great, Jen. I think I'm just going to live vicariously through you this year... no tree for me. I think this tree is beautiful. 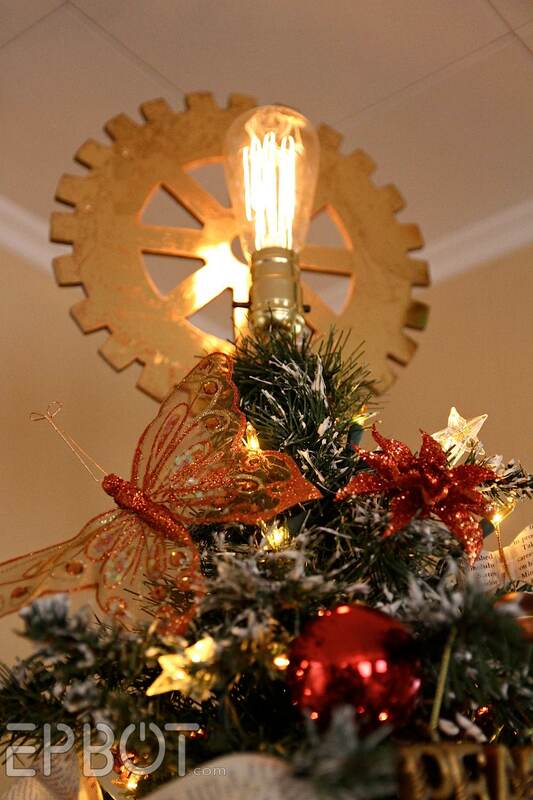 It's much brighter than the original steampunk tree, and less delicate than the original paper tree. I LOVE IT. So much awesome. Love this! 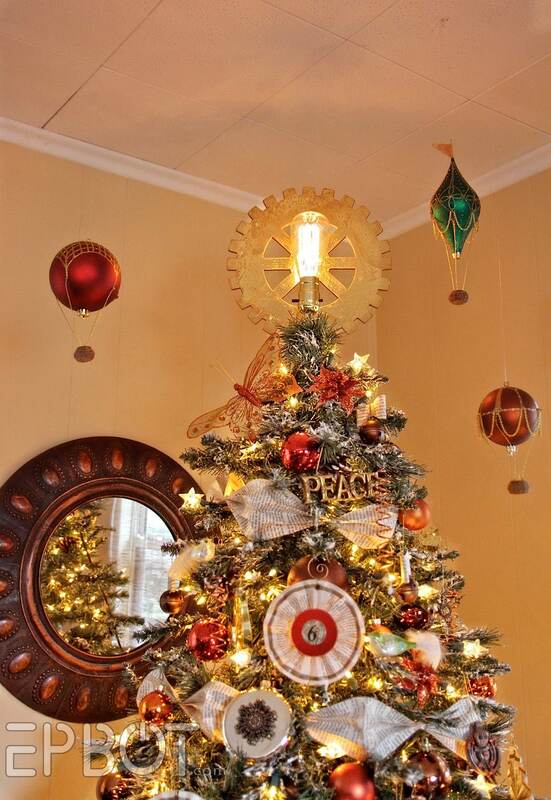 Great mix of steampunk and crafty, homemade ornaments. Sharyn is pretty amazing. She sent me a purple and teal necklace she made. I am missing a couple boxes of Christmas decorations so I'm thinking some of your Harry Potter ideas are in order this weekend. Because, you know, I have plenty of time to finish the 4 quilts that I haven't even started yet. Yeah, that'll happen! There's always next year, right? 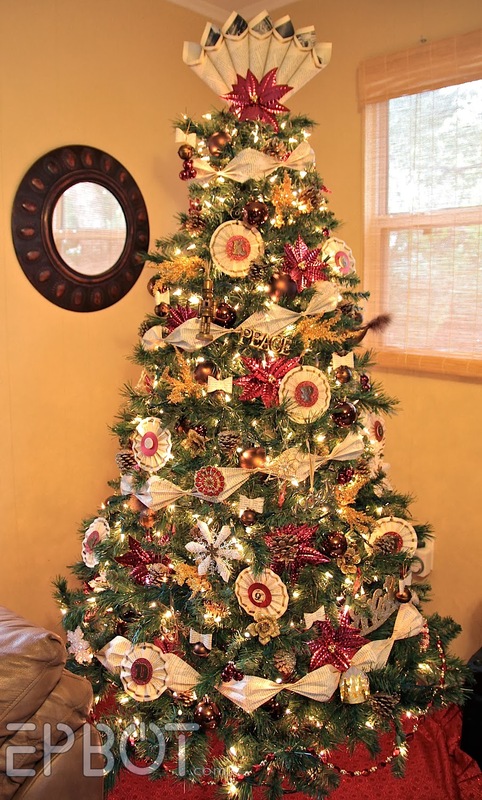 So I'm just going to say that you're doing all my decorating for me (just moved in October, and our trees are still buried behind piles of crap). I definitely like the combination! 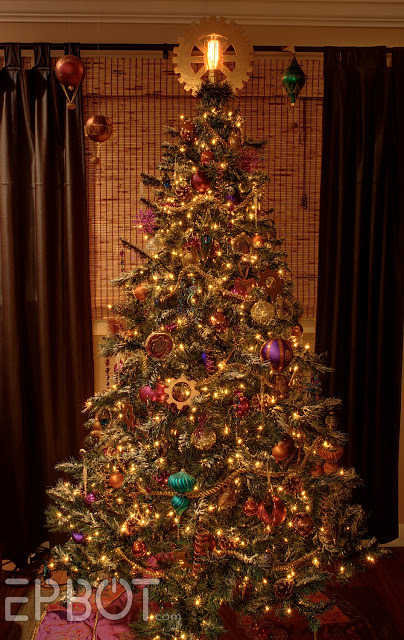 The new tree is stunning!!! I think it was meant to be! Awesome! Love the random Shuttlecraft in there! 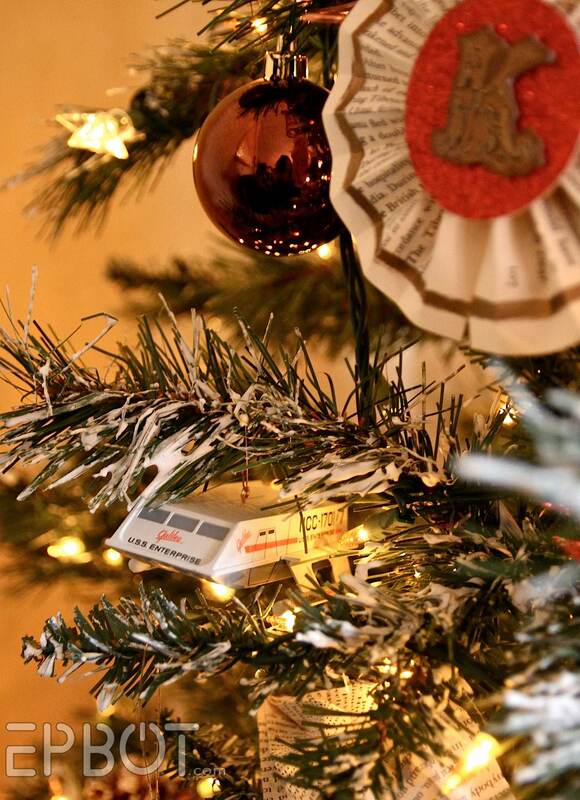 We have the same shuttlecraft ornament on our tree!!! That tree is amazing! Every time I think you can't come up with something any more fantastic you find something! 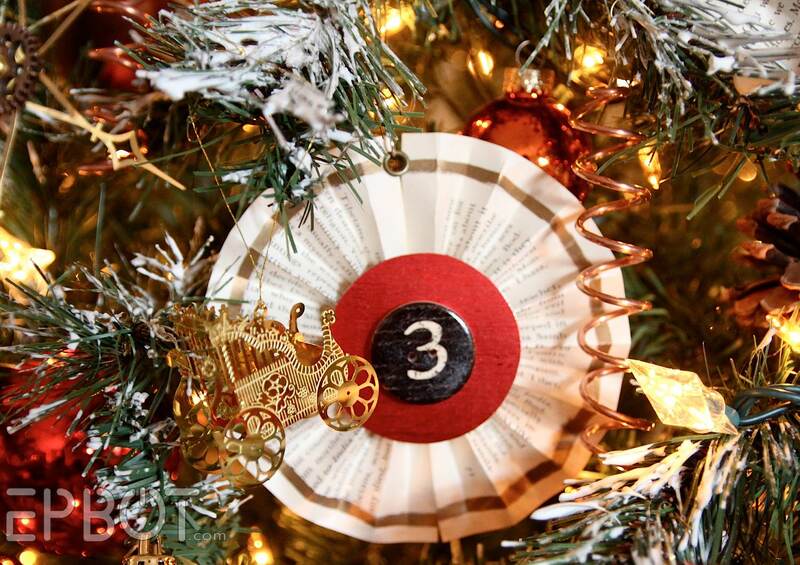 I am really loving those ornaments Sharyn made you. Wow -- such talent. Maureen -- I have it too -- and all the Enterprises, the Klingon Warbird, the Romulan Bird of Prey, DS9. etc., etc. etc. (Because Trekkie forever.) Oh, and thanks! That tree looks so amazing!!! I am with you I miss the teals and colorful bits but the copper and red and paper it just wow. You keep on rocking and being awesome!! 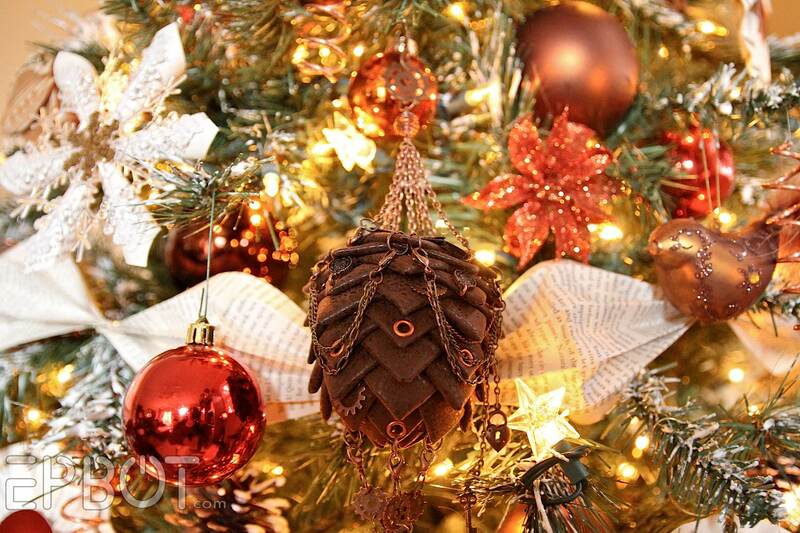 I work at Michaels and have directed several of my customers to your blog for tree flocking advice. Apparently nobody sells canned tree flocking anymore, but people still want it! As always, your trees are stunning! As always, you're such an inspiration. Merry Christmas and live long and prosper! Where did you find the clip on birds?? 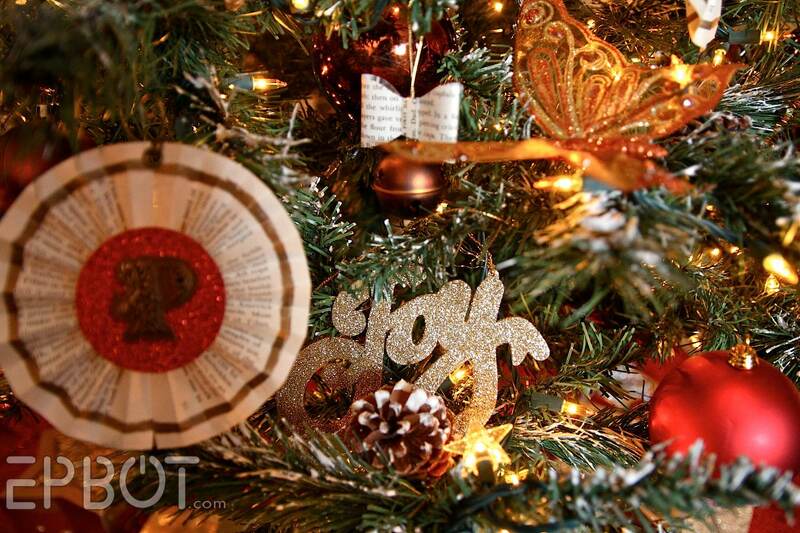 I love, love, love that specific style because they copy some my grandma had that were my favorite on her tree. I found some at World Market a few years ago, but have been unable to find them recently and want to expand on my mini flock. The birds are several years old now, but I found them at Epcot, if you can believe it! 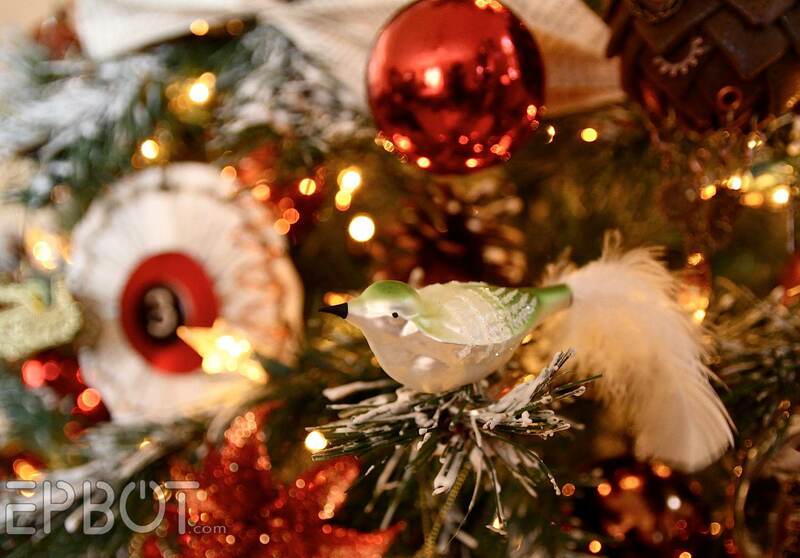 There's a Christmas shop in Germany, and they sell all old-fashioned glass ornaments in there, with lots of birds. Pricey stuff, but these were an extremely rare sale, so I couldn't pass 'em up!